Channel set diamonds sit beautifully in the gentle curve of this polished ring from The Forever Diamond. Set in palladium, the 950 hallmark indicates its 95% purity. A naturally white, tarnish resistant and hypoallergenic metal. Feminine and elegant, this ring is the perfect symbol of love. 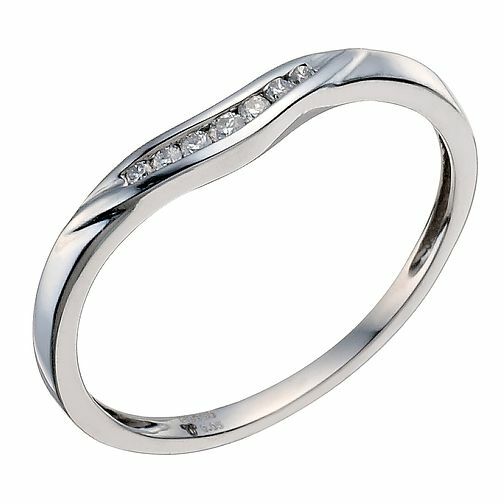 Palladium 950 Diamond Shaped Band is rated 5.0 out of 5 by 4. Rated 5 out of 5 by Anonymous from Beautiful ring I chose this ring as I was advised to buy a palladium band as my engagement ring is palladium. As soon as I tried it on it made my engagement ring really sparkle and the two look beautiful together. I'm really pleased with this ring and would definitely recommend. Rated 5 out of 5 by Anonymous from Beautiful I have this ring as my wedding ring. It fits perfectly with my engagement ring which is an old style so the dipped design of this one means they fit perfectly together and it looks beautiful.